Those who work in an office spend the greater part of their day sitting, often in front of a computer. This can cause all sorts of health issues and repercussions, especially if you slouch and/or aren’t using an ergonomic chair. In the list below, we have outlined exactly how sitting down all day can have a negative impact on our bodies and what we can do to prevent this. What sorts of issues can sitting down cause? Discomfort; particularly in the back, neck, shoulders, arms and hands. This can occur if you adopt awkward postures, repeatedly make the same movements, or don’t vary your posture. Stress; this is an adverse reaction to excessive pressures and demands. It can lead to mental health effects (like depression and anxiety), as well as physical problems (like digestive issues and other illnesses). Visual discomfort; using computers for prolonged periods may cause visual fatigue and discomfort (such as blurring and soreness of the eyes, and headaches to name a few). What can we do to prevent these issues? When getting up, move to the front of the seat and stand up straightening your legs (avoid bending at your waist). Chairs – A number of adjustments need to be made to your office chair to invoke good posture. These include the seat, backrest, lumbar support, armrests (if applicable), and the height. Workstations – If you have a fixed height desk, you might need a footrest to bring you to the appropriate height. 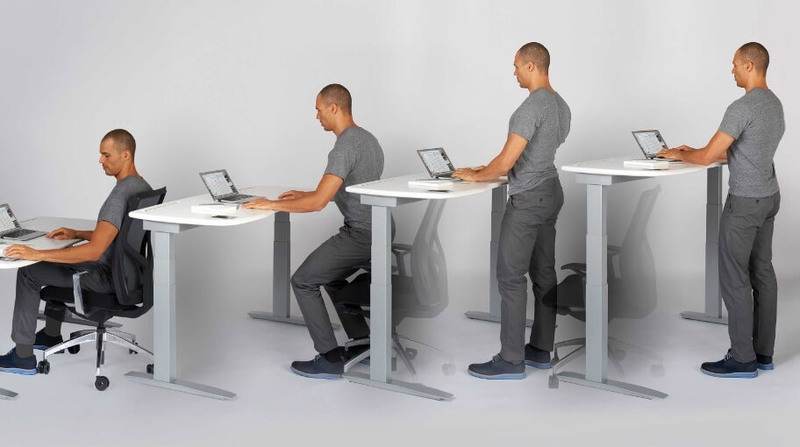 If you have a height adjustable desk, adjust your chair and then move onto the desk. Positioning – The keyboard should be directly in front of you and at a comfortable distance; the mouse should be close by; and the screen should be directly in front of you at eye level. Breaks – Keep in mind that no posture is ideal if maintained for long periods. You should take a break from the screen (and sitting) at least once every hour, from attending a meeting to photocopying. If you don’t believe that your workplace has been equipped with the right sort of furniture, you aren’t sure how to use it or you don’t believe it is working properly, ensure that you speak with your supervisor or manager as soon as possible. If you are experiencing any of the health issues outlined above, ensure that you make an appointment with your doctor.